This historical fortress is a lovely place to visit and houses two excellent museums. The Château which sprawls above the city was begun by William the Conqueror in about 1060, with later additions over the centuries. It is one of the largest medieval structures in France. 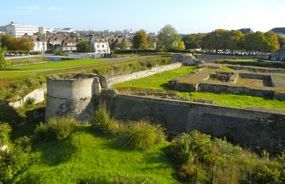 Today you can walk on the ramparts for great views of the city, and visit the two museums housed there. You enter through Saint Peter's Gate, an impressive barbican tower. You can then stroll the grounds, climb the ramparts, and look down on the archaeological excavations of the donjon, or keep, built in the 12th and 13th centuries. 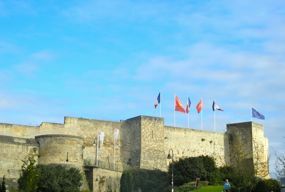 Climbing the impressive northern ramparts provides wonderful views of the city of Caen and the full Château. Several other towers, including the Queen Mathilda Tower and the Porte des Champs barbican can also be climbed for views. The small Église Saint-Georges is a reminder of the medieval parish that once existed there. The impressive Governor's Lodge now houses the Musée de Normandie. The Musée des Beaux-Arts is located in a modern building near the entrance to the Château. The Château provides a multi-faceted view of Normandy, through explorations of the historic edifice itself, along with its gardens, and the two very different museums. Above, Flags over the Château, Caen. Below, Excavations of the Keep, Caen Château. 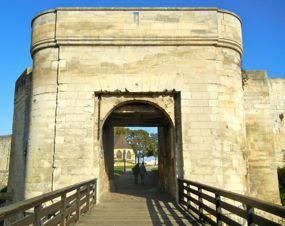 Above, Entering the Château through Saint Peter's Gate.